Versailles Bistro & Patisserie in Greenwich hosted a Bastille Day wine dinner celebration on July 14, 2014 with Le Wine Shop and Slocum & Sons. 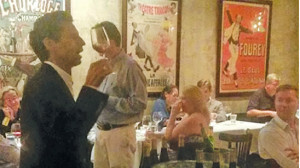 The event featured the wine estates of Domaine Jean-Marc Bernhard (Alsace, France) and Champagne Vollereaux (Epernay, France), alongside a special menu created to accompany the wines. 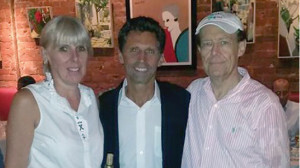 Owners of Versailles Bistro & Patisserie, Evelyne and Marc Penvenne with Eric Litchfield (center). Eric Litchfield, Import Sales Director, Slocum & Sons.